Hello kind readers. Today I'm reviewing a post from the "Institute for Responsible Technology" entitled "10 Reasons to Avoid GMOs". For those of you who are not familiar with the IRT, it's a "charitable organization" run by some guy: it's not a government institute, it's not affiliated with a university, research facility, or hospital. And when I say that it's run by some guy, that's not an exaggeration: its founder is not a scientist and doesn't have a background in science, to the best of my knowledge, yet he's a leader in the anti-GMO movement, and information from his "Institute" is often used as authoritative, scientific evidence of GMO harm. of GMOs unless you buy the IRT's book??? Before even starting, I noted that there are no hyperlinks to references or even a list of references at the bottom of the IRT's post. But, since I've seen this list pop up with greater frequency, I'll still read the list and try to figure out what it's all about. 1) GMOs are unhealthy. The website claims: "The American Academy of Environmental Medicine (AAEM) urges doctors to prescribe non-GMO diets for all patients. They cite animal studies showing organ damage, gastrointestinal and immune system disorders, accelerated aging, and infertility. Human studies show how genetically modified (GM) food can leave material behind inside us, possibly causing long-term problems. Genes inserted into GM soy, for example, can transfer into the DNA of bacteria living inside us, and that the toxic insecticide produced by GM corn was found in the blood of pregnant women and their unborn fetuses." The AAEM is an organization that believes that WiFi, "toxins" in vaccines, and water fluoridation are harmful. So not exactly the place I'd turn to for medical advice. In contrast, literally hundreds of scientific organizations have stated that crops generated through transgenesis (i.e GMOs) pose no greater risk than traditionally bred crops. Regarding the study finding Bt in the blood of pregnant women, that study has been found to be deeply flawed, because the method the authors used to detect Bt was made for plant cells, not mammalian ones. The IRT continues to highlight the dangers of GMOs by pointing out correlations: since GMOs have been introduced, the number of chronic health problems has increased. But there's no evidence that one causes the other. Could it possibly be that our population is just living longer? Or that we're getting better at diagnoses of many disorders/diseases? Summary: No credible evidence is provided demonstrating that GMOs are unhealthy. 2) GMOs contaminate - forever. Just when I thought the IRT couldn't get more dramatic, it goes on to say: "Self-propagating GMO pollution will outlast the effects of global warming and nuclear waste." The IRT claims that this genetic pollution is affecting all of us, particularly organic farmers. I've never heard of a farmer losing organic certification in the US/Canada due to "GMO contamination", maybe because there was such a thing as "cross-pollination" before GMOs existed and farmers who are concerned about this take proper measures to prevent it from happening by establishing appropriate buffer zones with surrounding farms. So unless the IRT can establish that GM pollen is some sort of super-pollen that spreads further or pollinates more easily or that the pollen will survive for all eternity, then I can't really buy this argument. To support my statement, here's the USDA's latest report on coexistence of GM crops and non-GM crops. I know!! Isn't it crazy that the organization that certifies organic farms actually has guidelines on how organic farmers can coexist with GM crops?? The report also contains information on surveys conducted by the USDA to determine if farmers have experienced economic losses due to GMO contamination. However, the report doesn't distinguish or examine how these losses occurred: was it due to cross-pollination in the field, contamination during harvest, during transportation, or storage, for example? Despite the flaws in their numbers, it's still incredibly low: only 87 farmers experienced losses due to GMO contamination between 2011 and 2014 in 20 states surveyed. 3) GMOs increase herbicide use. The website claims "Between 1996 and 2008, US farmers sprayed an extra 383 million pounds of herbicide on GMOs." The amount of herbicide used isn't a very useful statistic. Is it because we have more fields dedicated to herbicide tolerant crops? Was there a decrease in other herbicides? Were the other herbicides harsher on the environment and have a more toxic profile? The article goes on to say: "Roundup, for example, is linked with sterility, hormone disruption, birth defects, and cancer." There's no evidence for any of this. The EPA examined whether glyphosate is linked to hormone disruption and found "no convincing evidence" to support it. Regarding Round-Up and cancer, "a Joint Meeting of the Food and Agriculture Organization of the United Nations (FAO) Panel of Experts on Pesticide Residues in Food and the Environment and the World Health Organization (WHO) Core Assessment Group on Pesticide Residues (JMPR)" recently stated that "glyphosate is unlikely to pose a carcinogenic risk to humans from exposure through the diet". 4) Genetic engineering creates dangerous side effects. The article claims that by "mixing genes from totally unrelated species, genetic engineering unleashes a host of unpredictable side effects". There are several papers that have done comparisons on unanticipated consequences/changes of GMOs and traditionally bred crops (see here, here, and here). In each case, the transgenic crop had fewer unanticipated changes in DNA and/or RNA than the traditionally bred crop. To read more about these studies, see this post. So perhaps the IRT is concerned about the ratstrictor or something, otherwise I'm not sure what they're referring to. 5) Government oversight is dangerously lax. The paragraph explains that GMO safety studies are not required. Technically, this is true. All GMO safety studies and submissions are voluntary. However, to date, I don't know of any GMOs that haven't gone through FDA approval. As such, the voluntary testing of GMOs is only on paper, not in practice: in practice it is mandatory. Surprisingly, the FDA's process for approving GMOs is one that was meant to be applied to all novel crops. This op-ed from Nature explains: "[The FDA] recommended through a guidance document — not a regulation — that developers of foods derived from 'new plant varieties' undergo a voluntary consultation process with the agency. This guidance did not exclude non-GE new plant varieties. In practice, however, developers of conventionally bred foods seem not to have undergone such consultations, whereas the FDA has been notified of more than 100 foods derived from GE plants (see go.nature.com/z78s1e)." This "voluntary but not really voluntary" aspect of the regulatory process of GMOs is one that, I believe, should change because it can be exploited by organizations such as IRT to imply that safety studies are not conducted. Not only is the FDA involved, but EPA and USDA-APHIS are also involved in the regulatory process, depending on the trait. However, Biotech Regulation in US is being restructured to make it simpler, and to adapt it to newer crop modification techniques. 6) The biotech industry uses “tobacco science” to claim product safety. 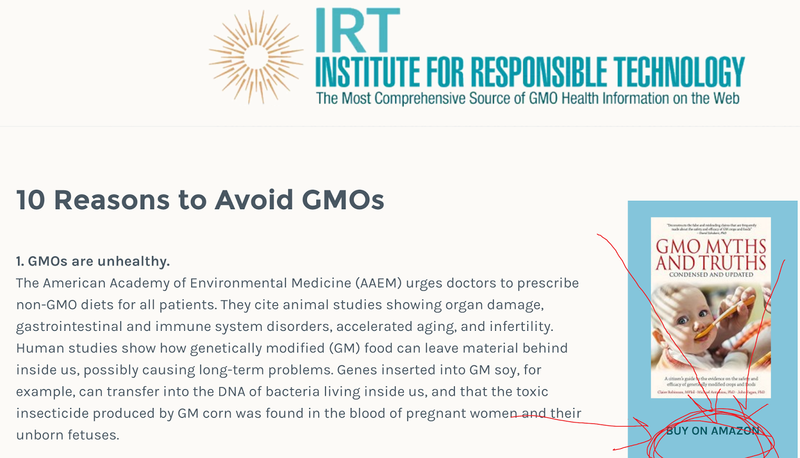 IRT's point here is to suggest that the only scientists claiming that GMOs are safe are those that are paid off by large companies, whereas independent scientists know that GMOs are dangerous. They draw a parallel between scientists who claim that GMOs are safe and scientists who claimed that tobacco is safe. I was curious as to how the scientific consensus on tobacco safety was obtained, and I found this paper (H/T Skepticalraptor's post on the topic). To generate a scientific consensus on a topic, there needs to be enough research to support a conclusion. The paper I've linked to highlights that it took decades to generate a consensus on whether tobacco is safe or not: first, it took a few years to observe that there was an increasing incidence of lung cancer, and it wasn't until the 50's that case-control studies were conducted associating cigarette smoking with cancer. After several such studies were conducted, the medical organizations of the time issued statements highlighting the association. The tobacco industry defended the safety of their products and funded research to demonstrate this, but this stands in stark contrast with the safety of GMOs: the scientific consensus on GMOs is supported, not only by the industry, but also by dozens of reputable scientific organizations around the globe. The scientific consensus on cigarettes was not upheld by the tobacco industry. Basically, if the tobacco industry can't pay off the WHO to say that smoking cigarettes is safe, then neither can Monsanto. You can read more about the consensus on tobacco, how it was opposed, and how researchers within the tobacco industry spoke out here. 7) Independent research and reporting is attacked and suppressed. IRT quotes an article from Nature from 2009 about how scientists who show the harm of GMOs are attacked or are censured. Here's the full article from Nature and I'd like you to read it to see just how much cherry-picking was done by IRT. The article highlights how research on GMOs that generate results suggestive of harm elicit two responses: from the anti-GMO camp, the information is used to campaign against the crops and to drive policy; from the pro-GMO camp, there is swift criticism of these papers to highlight any flaws there may be. The article interviews scientists who have been criticized and those who conducted the criticism and provides perspectives from both sides. The pro-GMO camp basically states that papers on controversial topics need to be reviewed more carefully, since they can and are used by activists to further their agendas, even if the papers are heavily flawed (which is ironic, because I'm reviewing a piece from the IRT which does exactly that). As for IRT's claim that research is being "suppressed", I'll need a citation for this. 8) GMOs harm the environment. The IRT claims: "GM crops and their associated herbicides can harm birds, insects, amphibians, marine ecosystems, and soil organisms. They reduce bio-diversity, pollute water resources, and are unsustainable." However, there's no evidence to support this. The National Academy of Sciences (NAS) recently released their report reviewing GMOs and stated: "Overall, the committee found no conclusive evidence of cause-and-effect relationships between GE crops and environmental problems." The NAS' answer is more nuanced, provides many examples of why there's no conclusive evidence, and I encourage you to review the document. 9) GMOs do not increase yields, and work against feeding a hungry world. The NAS report states that GMOs have not really increased yields, although the IRT doesn't use this document to make this statement. It's important to note that none of the GMOs that are currently on the market were directly designed to increase yields. The NAS' summary states that, although there is disagreement on whether the current traits on the market have improved yields, there's no data to suggest that the increase in yields that farmers have observed due to GMOs are different from the increase in yields that farmers have observed in conventional farming. However, from my perspective, not having seen an increase in yields isn't a reason to shun GMOs: transgenesis gives agronomists the ability to create crops designed to withstand stresses or be more efficient, and using such traits we may see increases in yields. The IRT makes similar statements regarding current GMOs and their ability to feed the world. Again, none of the GMOs on the market are currently fortified, but transgenic crops have the potential to help reduce malnutrition and there are a few projects that have made lots of headway. 10) By avoiding GMOs, you contribute to the coming tipping point of consumer rejection, forcing them out of our food supply. Ah... We finally get to the heart of the matter. The IRT doesn't want to just label GMOs, but to get rid of them entirely from the food supply. The IRT makes this really convenient, by making a handy dandy shopping guide for people who want to avoid GMOs. And guess who sponsors the guide?!? ZOMG! Food companies that want you to buy their food!!! !